In a Hubble picture, a red circle indicates an object in a distant galaxy that could be an ejected black hole. A monster black hole has been flung from its home galaxy andis careening through space, according to a new study. Astronomers spotted the supermassiveblack hole ? the type usually found lurking in the center of galaxies ?hightailing it out of a distant galaxy at considerable speed. The cosmicejection is taking place more than half a billion light-years from Earth. Thediscovery was made with archived observations from the ChandraX-ray Observatory. Though black holes themselves don't shine, the material theygobble up heats as it falls in and releases radiation in the form of X-raylight. Normally these bright X-ray spots are seen in the centers of galaxies,but in this case, researchers found one offset to the side. The kicked-out black holecould result from a special set of circumstances, according to computersimulations. Supermassive black holes can contain the mass of more than abillion suns. Just how they accumulate all that mass is unknown, but someastronomers think they form when two smaller black holes collide. Depending on the direction and speed with which the two blackholes rotate before they merge, the resulting gigantor may be thrown out of thegalaxy,resulting in the cosmic interloper spotted in the Chandra observations. Studying such recoiling black holes could provide more cluesabout how supermassive black holes form. 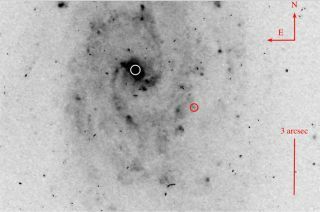 Undergraduate student Marianne Heida of the University ofUtrecht in The Netherlands spotted the rogue black hole monster while poringthrough the Chandra Source Catalog ? a listing of bright X-ray sources in thesky made by the orbiting observatory. Heida, who worked on a project at the SRON NetherlandsInstitute for Space Research, compared these X-ray spots with the known positionsof millions of galaxies to map out the locations of supermassive black holes. This oddball black hole may be just the first of manysimilar discoveries to come, the researchers said. "We have found many more objects in this strange classof X-ray sources," Heida said. "With Chandra we should be able tomake the accurate measurements we need to pinpoint them more precisely andidentify their nature." Heida and the research team, led by SRON astronomer PeterJonker ? reported their findings in the journal Monthly Notices of the RoyalAstronomical Society.